“I often review good books. Sometimes I review great ones. 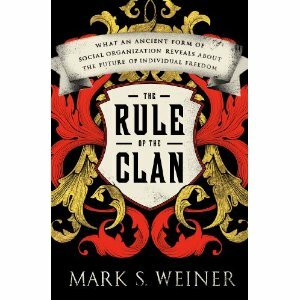 The Rule of the Clan … gets the highest compliment of all: it is an academic book that is clearly and engagingly written so as to be broadly useful. … Strongest recommendation.” — Mark Safranski, Zenpundit. Click here to read an interview with the blog Concurring Opinions. Click here to read a week-long online academic symposium about the book on Concurring Opinions, with an international group of participants. Click here to watch a lecture about the book’s national security implications at the Kennedy Center for International Studies at BYU and here for a panel discussion at the Clarke Forum for Contemporary Issues at Dickinson College. Available through Amazon, Barnes and Noble, Books-a-Million, IndieBound, Overstock, Powell’s, other on-line stores, and at a local bookseller near you.